Historically a source of emigrants to Northern Europe and the New World, Italy has rapidly become a preferred destination for immigrants from the global South. Life in the land of la dolce vita has not seemed so sweet recently, as Italy struggles with the cultural challenges caused by this surge in immigration. Marvelous Bodies by Vetri Nathan explores thirteen key full-length Italian films released between 1990 and 2010 that treat this remarkable moment of cultural role reversal through a plurality of styles. 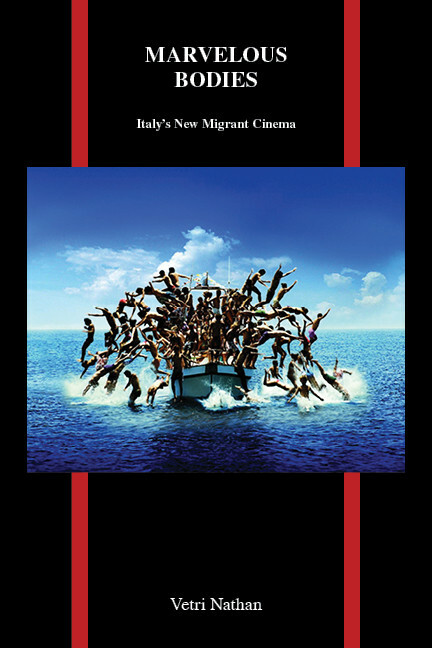 In it, Nathan argues that Italy sees itself as the quintessential internal Other of Western Europe, and that this subalternity directly influences its cinematic response to immigrants, Europe’s external Others. In framing his case to understand Italy’s cinematic response to immigrants, Nathan first explores some basic questions: Who exactly is the Other in Italy? Does Italy’s own past partial alterity affect its present response to its newest subalterns? Drawing on Homi Bhabha’s writings and Italian cinematic history, Nathan then posits the existence of marvelous bodies that are momentarily neither completely Italian nor completely immigrant. This ambivalence of forms extends to the films themselves, which tend to be generic hybrids. The persistent curious presence of marvelous bodies and a pervasive generic hybridity enact Italy’s own chronic ambivalence that results from its presence at the cultural crossroads of the Mediterranean. Vetri Nathan, University of Massachusetts Boston, holds his PhD in Italian from Stanford University. Nathan’s research interests include immigrant cultures and globalization in contemporary Italy, colonialism and postcoloniality, Italian cinema, and food studies.